I hope you all had a great end to 2017 — ideally with some time off relaxing, with family or friends, outside, or just doing something that makes you happy. I spent the last week in Palm Springs with family (did you see all those palm trees!? ), and it was honestly amazing. I didn’t expect to love Palm Springs (I thought it would feel resort-y and fake), but I honestly LOVE it. Like, would go back in a heartbeat. Anytime. Who knew!? While we were down there, we rode up the tram (SO COOL) and then went out to breakfast at Cheeky’s, where I ordered a green frittata much like this. WHERE HAS THIS BEEN MY WHOLE LIFE!? This thing is tasty, packed full of green veg (MY FAVE), topped with more greens and avocado — and I added in some goat cheese, along with pesto in the eggs! Seriously, genius. DELICIOUS. 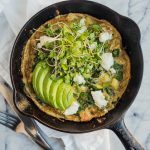 This recipe is for a single serving frittata (for a hungry person) — it only calls for two eggs, and I used a 7″ pan to cook this (6″ would have been ideal for a bit more thickness!). You could easily scale this recipe up for a crowd! 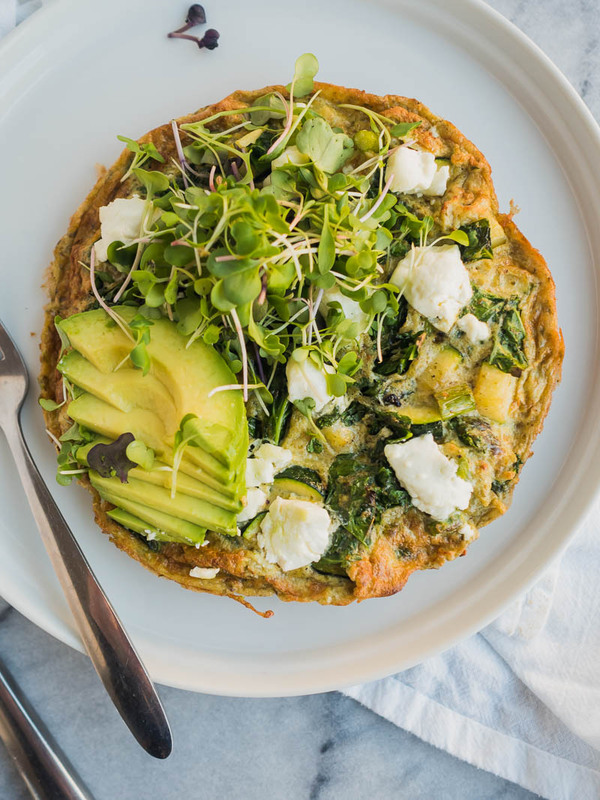 This single-serving frittata is packed full of healthy green vegetables, topped with goat cheese and avocado, and cooks quickly. In a small heavy-duty skillet (I used a 7″ cast iron, I think as small as 5″ would work), heat the butter or oil over medium-high heat. Add the asparagus and zucchini and cook, stirring occasionally, for 3-5 minutes. The vegetables should be bright green and beginning to soften. While the vegetables are cooking, whisk together the eggs, pesto, 2 pinches of salt, and a few turns of fresh ground black pepper, until the eggs are very smooth and whipped. Set aside. 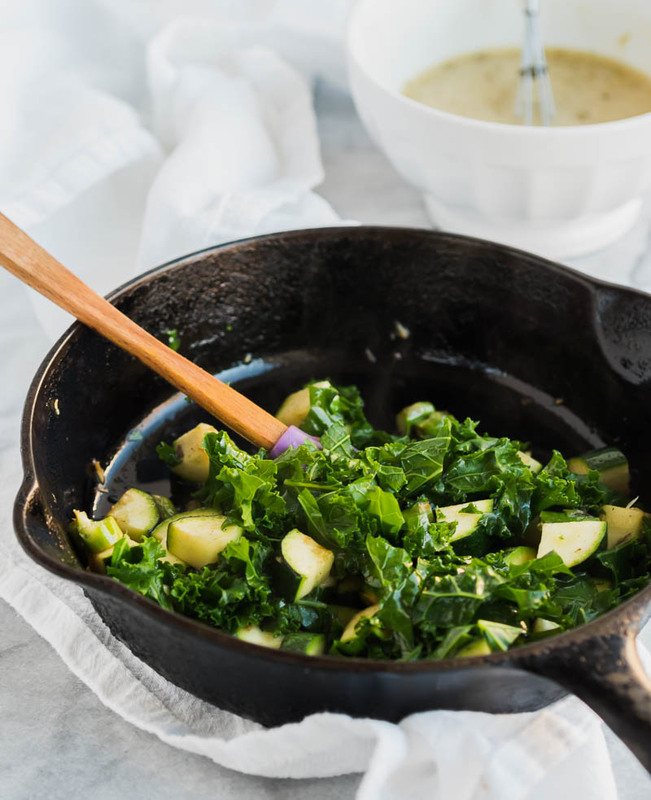 Add the kale to the pan, and put a lid over the pan for 1 minute. Stir the kale together with the vegetables, and once fully wilted spread all of the vegetables in an even layer in the pan. At this point, if your pan is looking really dry I recommend you add some more butter or oil. Pour the eggs into the pan in an even layer. Let cook for 1 minute, then use a small spatula to lift the edges and allow uncooked egg to run under the cooked layer. Work your way around the edges of the pan until most of the egg is cooked. 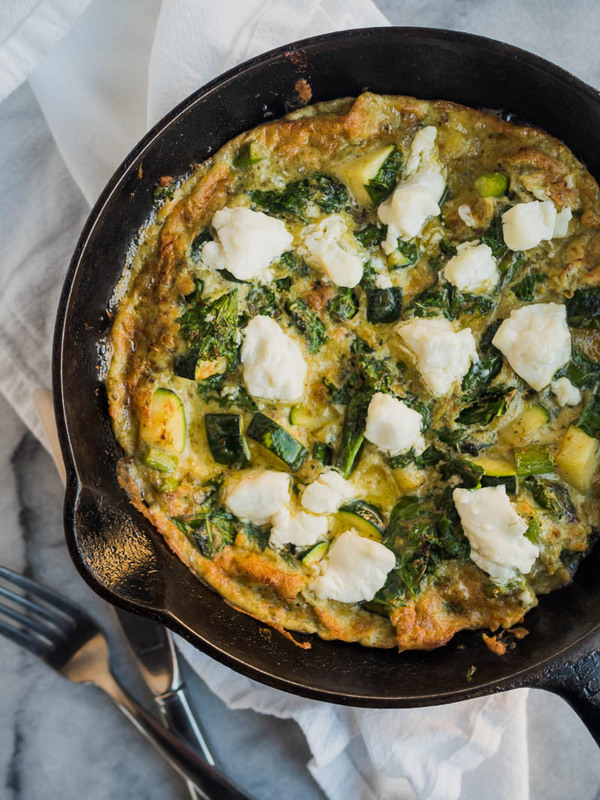 Use your hands to break the goat cheese into small pieces, and scatter it on top of the frittata. Broil, just a few inches under the coils, for 2-3 minutes. The frittata should puff up, the cheese will soften, and the edges will brown. 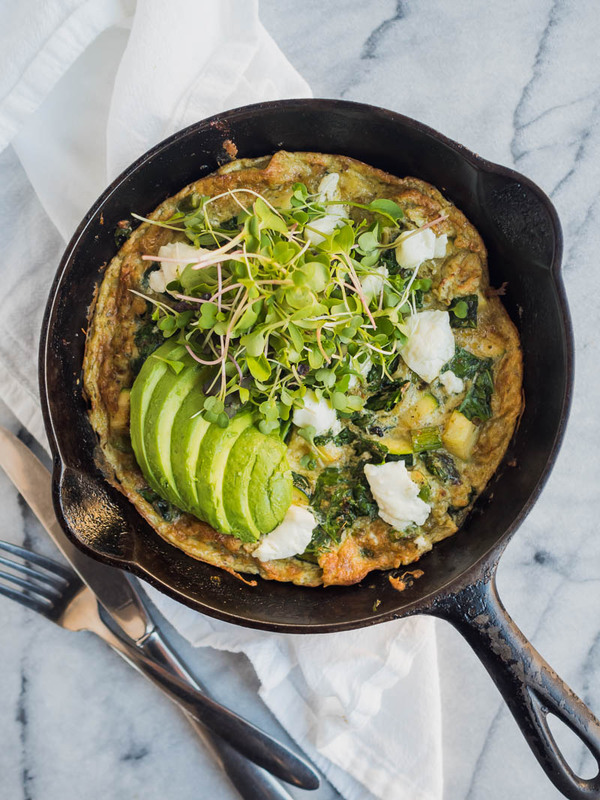 Remove the frittata from the oven, and top with sliced avocado and a big handful of greens. Serve warm, either in the pan, or transferred to a plate. Disappointed the nutritional information [cal carbs, fat, etc] was not included in this recipe. Sorry to disappoint, Anee! This is a *free* *personal* blog which makes zero claims around providing nutrition information, so feel free to enjoy this *free* recipe and calculate the nutrition info yourself!